This book was a surprise to me. While I love Robyn Carr and the Virgin River series (and was most excited to read her story), it was the other two stories that made this book a solid winner - and it even renewed my interest in Victoria Dahl. 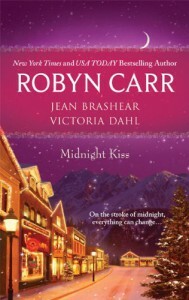 Midnight Confessions by Robyn Carr (Virgin River) -- 2.5 stars. Midnight Surrender by Jean Brashear -- 4.5 stars. Midnight Assignment by Victoria Dahl -- 5 stars. Overall this book is well worth buying and reading. I got it as an ARC copy through Netgalley, but would have bought it just for the VR story. And while I didn't think the VR story was all that wonderful, the other two more than make this a must read for fans of contemporary romance anthologies.